The 10K run will start at the quay in Kinvara and head West through the town along the N-67. Just over 2K outside the town the race will turn left on the Cahernamadra Road (L-8586) and will link up with the Trellick Road. Half marathon runners will join the course at this point. 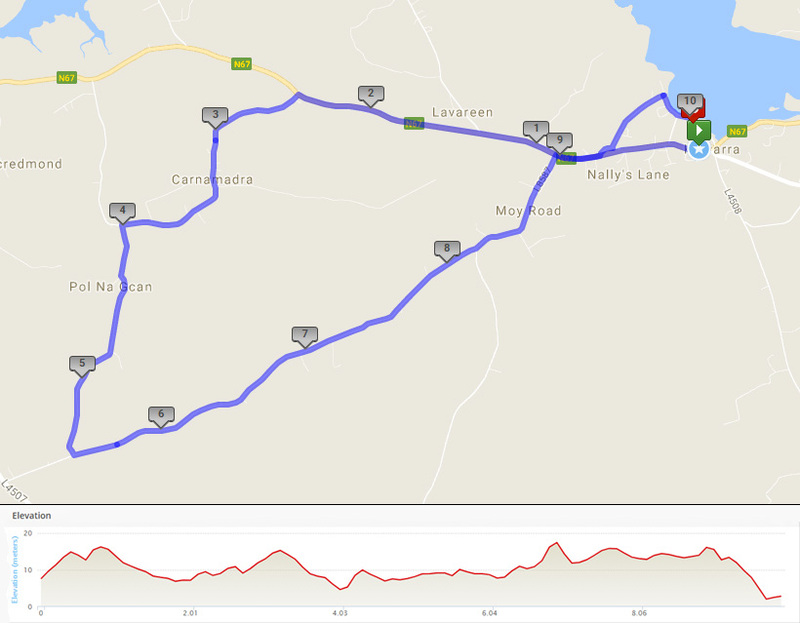 The race will turn left, continue onto the Moy Road and turn right at the intersection with the N-67 (towards Kinvara). Runners will be lead to the quay via Nuns Orchard and will finish back where the race started on the quay in Kinvara. The 10K course has a quick start as you head out on the N-67. There is a tough section between 6K and 7K but after that there’s a quick finish back in to the village. The N-67 is the main road through the village of Kinvara and this will remain open throughout the race with traffic being managed at key junctions. Other than that the 10K route will be closed to traffic. For more details on road closures please see the Residents Info page.